I am currently pursuing my undergraduate degree at the Institute of Business Administration (IBA), University of Dhaka. I went to Notre Dame College. My school was, Bethany Residential School, in Darjeeling, India. It was a boarding school in a very beautiful landscape. Every month, we had a talent night where students could perform. There was a short story in our book called 'The Three Men of Gotham'. A friend and I decided to make a play out of that and act it on stage. That was my first take on acting and directing. Apart from that, there were times when I would finish all my pocket money way ahead of the holiday season. And the rest of the days would be painful as I would not be able to buy any delicacies from the canteen. I represented my school in the regional inter-school athletics competition. My event was a 400m run. I finished third in the qualifier round ahead of a six feet tall sprinter and made it to the final. In the last few seconds, we were abreast of each other. I managed to pull it off in the end. A moment I shall always remember. At the start of every holiday season we would anxiously wait to see our parents. It was a big school with many students. Whenever a student's parents would turn up, the warden or one of the in-charges would announce it loudly in the dormitory. My most anticipated moments were the call of my name and the sight of my parents at the school gate during the start of every holiday season. My class teacher in standard five, Mr Cedric Pereira, would always ask us to do something different. He emphasised it during study, during sports, during school performance and even in terms of attitude. I feel this statement has got etched into my soul. Life is a manifestation of trying to do something different. He was the first teacher in my life who taught me that questions could be and should be unseen in exam and answers should be written spontaneously from a student's understanding of a lesson instead of writing down memorised paragraphs. I had a knack for writing and storytelling as a school boy. 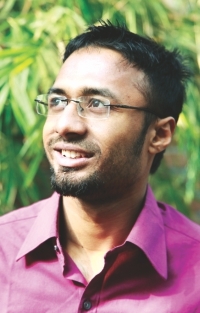 After coming to Dhaka, I began working as a journalist. As one of my assignments, I was asked to cover the 11th International Short and Independent Film Festival, Dhaka, in 2010. I attended many screenings and interviewed many independent film makers. This made me realise that cinema is a whole new way of telling stories. Two years later, my animated fiction Pizzassin became an official selection in the 12th edition of the festival. Another film, Hortal, a political docudrama, was awarded the best film at the Inter University Short Film Festival hosted by North South University Cine and Drama Club. I am currently working on my feature film, 'The Quest of Mostofa'. It is the first animated western genre film that is set on the ground of our liberation war. The film is scheduled to be released in January, 2016. I will suggest to all the young readers what my class teacher had suggested to me. Try to be different. The mindset to be different encourages us to do new things.